Auschwitz survivor Miroslaw Celka walks out the gate with the sign saying "Work makes you free" after paying tribute to fallen comrades at the "death wall" execution spot in the former Auschwitz concentration camp in Oswiecim, Poland, Jan. 27, 2014. Around 300 survivors of the Auschwitz death camp were gathering on Tuesday to mark 70 years since its liberation by Soviet troops, joined by world leaders for a commemoration held in the shadow of war in Ukraine and a rise in anti-Semitism in Europe. Tuesday's gathering in southern Poland marks perhaps the last major anniversary that survivors of the Nazi German camp will be able to attend in numbers, given the youngest are now in their 70s. Some 1,500 attended the 60th anniversary. Around 1.5 million people, mainly European Jews, were gassed, shot, hanged and burned at the camp in southern Poland during World War Two, before the Red Army entered its gates in winter 1945. It has become probably the most poignant symbol of a Holocaust that claimed six million Jewish lives across Europe. The presidents of Poland, Germany, France and Ukraine are expected among hundreds of dignitaries. Notable for his absence will be Vladimir Putin, whose military intervention in Ukraine has helped drive West-Russia relations to their lowest ebb since the Cold War. Poland has been one of the most vociferous critics of Russia's March annexation of Ukraine's Crimean peninsula and its support for pro-Russian separatists in eastern Ukraine. Wary of the domestic political consequences, Poland did not send a full diplomatic invitation to Putin, sources have told Reuters. “There is a war going on in east Ukraine,” Polish Justice Minister Cezary Grabarcyk told Polish ZET radio. NATO says Russia has sent men and armor to aid the separatists. Putin denies this, but risks new sanctions when European Union foreign ministers meet on Thursday. 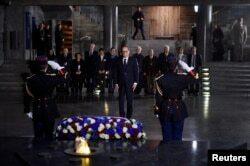 French President Francois Hollande (C) pays his respects after he placed a wreath at the Shoah memorial in Paris, Jan. 27, 2015. France's Francois Hollande makes the trip less than three weeks after Islamist gunmen killed 17 people in Paris in attacks on the Charlie Hebdo satirical weekly newspaper and a kosher supermarket. Four French Jews were among the dead, the latest victims of a recent spate of armed attacks on Jews in Europe. European Jews warn of a growing under-current of anti-Semitism, fuelled by anger at Israeli policy in the Middle East and social tensions over issues of immigration, inequality and economic hardship that have contributed to a rise of far-right political movements, notably the grass-roots PEGIDA movement in Germany. On the eve of the anniversary, Chancellor Angela Merkel said Germans had an everlasting responsibility to fight all forms of anti-Semitism and racism. The camp's victims also included, among others, Roma, homosexuals and political opponents of the Nazis. David Wisnia, an 88-year-old survivor of Auschwitz, said on Monday the Holocaust was “almost impossible for a human mind to comprehend.” A choir boy as a child at Warsaw's Great Synagogue, which was blown up by Nazi forces in 1943, Wisnia will sing a memorial prayer in Hebrew on Tuesday. “I pray to God that we as human beings are able to learn something from it,” he said.